Writing good story beginnings is a crucial skill for fiction writers for one very important reason. If the first chapter of a novel doesn't grab a reader's interest, they will likely stop reading. Worse, agents and editors often decide to pass on a book based on just the first page or two. A weak opening can be the kiss of death for an otherwise great novel. So lets look at some of the options for story beginnings, as well as some cliched openings you might want to avoid. Good story beginnings entice readers to keep reading. If the beginning of a novel captures a reader's interest enough to keep them turning pages, it's a good beginning. If it doesn't, it's not, and it's doubtful a publisher will be interested in the book either. Establish an intriguing narrative voice. Connect the reader to a sympathetic character in a predicament. Present an event (action or decision) that promises to ignite a chain of events with significant consequences. Introduce an intriguing idea, situation, or proposition that begs exploration. Make a promise (show what type of story the reader is in for). Establish the genre, tone, narrative voice. Introduce at least one character. Introduce an intriguing story world. Introduce a theme or philosophical perspective. But don't feel your story beginnings must do all these things, or even most of them. The important thing is that they hook the reader. The above techniques, in any combination, can help with this. in possession of a good fortune must be in want of a wife." The rest of the novel then proves that statement by showing how all the single men end up with wives. As you may know from elsewhere on this site, Dramatica theory states that every complete story has four throughlines. The overall throughline, or main plot concerns the story goal, and affects or involves all the characters in the story world. It's an objective perspective on the story. The other three throughlines are more subjective and concern the arcs of the main character's inner conflict, the impact character, and the relationship between the main and impact characters. Assuming you're telling your story in chronological order, this model actually gives you five potential places to begin your story. Let's say you want to start with your overall throughline (or main plot), which concerns the pursuit of the story goal. There are two possible points within this throughline where your story could begin. Option 1: Start with the initial driver -- the event that begins the story and without which the rest of the story would not happen. This is a valid choice, however there are reasons why you may wish to avoid it. For instance, the initial driver often is an event that happens long before the main character enters the story. For example, in The Lord of the Rings, the initial driver is Sauron's loss of the ring, which happens 3,000 years before Frodo is born. In other stories, the initial driver occurs when the main character is too young to make the connection with the reader. For example, when Voldemort kills Harry Potter's parents, Harry is only a year old. So we don't properly meet Harry until a decade later. The challenge with such initial drivers is that many readers want to meet the main character on page one, and if they don't, they may put the book down. Option 2: An alternative is to pass over the initial driver, and begin Chapter One with the first Overall Signpost. This works if the protagonist is also the main character, and so would be a central figure in the Overall throughline. The writer can fill the reader in on the initial driver later in a flashback or through some other device. Postponing an account of the initial driver has the advantage of creating a little mystery. For instance, the first Overall Signpost generally shows the characters reacting to the initial driver. If the reader doesn't know what they are reacting to, she will wonder what happened. So she keeps reading to find out. In either case, and especially in a plot-driven story, your story beginnings will be far more effective if they involve an event. An event is an irreversible change that sends the characters in a new direction (and makes the reader wonder what will happen next as a result). Try not to begin a story with pages of exposition, backstory, or anything else that can be called preamble, especially if you are writing genre fiction. You don't want your reader thinking, "Is anything actually going to happen in this book?" Instead, use an event to start things happening right away. Lengthy physical description of main character. A journey to where the story begins. The main character thinking, philosophizing, feeling. A tour/lengthy description of the main character's house/room. An insignificant day in a character's life or character performing mundane activities. Take note especially of this last point. There is a widely misinterpreted piece of advice given to writers that says a story should begin with "an ordinary day" in the main character's life. The trouble is that most people's "ordinary" days are dead boring, and the last thing you want to do is make your first chapter boring. One way to avoid preamble is to use a technique called in medias res. I have discussed this at length in a different article (feel free to click on it), but briefly it means to begin "in the middle" of the action. Let the curtain rise on an event already in progress. Beginning with the Subjective Throughlines. Option 3: the first Main Character Signpost. 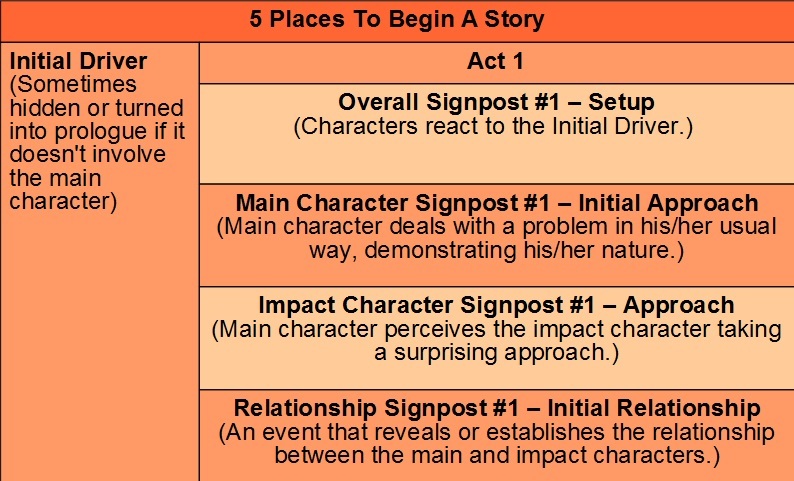 Begin with an event that shows who the main character is at the time the story begins. Show the main character tackling a problem in his/her unique way. Use this event to reveal and establish the main character's personality. Note that these throughlines have an important thing in common: they all involve the main character and can satisfy the reader's desire to meet the main character quickly. Lengthy history/description of setting (“infodump”). Pitch battle or intense action. Opening in a minor character's perspective (especially one who quickly dies). I know what you may be thinking. A pitch battle? Wouldn't that be a way to open in medias res? Isn't that a good thing? If the action scene is the inciting incident, that can be an effective beginning for some readers. But other readers will not care about the action scene unless they connect with the main character first. Similarly, some readers dislike opening with dialogue -- unless they have first connected with the main character. As for the last point (opening in a minor character's perspective), some readers feel it is a "bait and switch." It can be disconcerting to get attached to a character in the first chapter, only to have that character snatched away and replaced with the real main character. So introduce your main character in Chapter One -- preferably on the first page. Open with the character's point of view and predicament. Create empathy by giving the character dilemmas, challenges, failings, worries, strengths, ideas, feelings, etc that the reader can relate to. Make the character likable (charm). In genres defined by audience, make the character close in age and gender to the typical reader. Most important... when you begin with your main character, don't start with an ordinary day in his/her life. Make it a day when something extraordinary happens to the character -- when they have to deal decisively with a tough situation or problem. Remember that, even though they have more to do with character, the subjective throughlines are still made up of events, just like the overall throughline. Personality is best revealed through actions and decisions a character makes in response to problems. Good story beginnings show how the main character deals with a problem, because that tells the reader who this person is. It establishes a baseline for the character, before events of the story have a chance to pressure him/her into becoming someone else. So create an event that lets the reader see the character's initial strengths, weaknesses, attitude, etc. Give the readers all the information needed to realize this is a character they want to spend time with. There are some story beginnings that everybody uses when they're starting out. Please note that there is nothing technically "wrong" with any of them. You will see plenty of published novels that use them. The main character waking up -- followed by a morning routine (too much preamble). The main character stands before a mirror or wardrobe and thinks about her appearance (a not very subtle way to work in the main character's physical description, especially in first person). An alarm bell spurs the hero into action. A description of the weather. The main character weeping (an attempt to evoke curiosity). The main character wakes up with amnesia or in a strange place (in fact, any type of waking up is overused). A writer stares at a blank page (wonder where that idea came from?). The main character stares out window and thinks/feels/reflects. The main character sits alone in restaurant/bar/cafe waiting for someone who is late. When you're revising your first draft: Go back and cut the opening pages up to the point where something interesting or important is happening. If you're afraid of cutting too much material from the beginning: Show both versions to different people and ask them which version makes them want to read on. I should also point out that not every story begins with the first act. Sometimes, if the start of a story is a little weak, a writer can compensate by starting at a more interesting point in the story (a flash forward) and then tell the beginning later. Begin at the resolution, and then jump back and tell all the events in order that led up to the resolution. Begin at the crisis, then jump back and tell all the events that led up to the crisis. Then tell everything that happens after the crisis (the resolution). Begin at the complication, jump back and tell the setup, then jump forward and tell the crisis and the resolution. Non-chronological story beginnings can have the added advantage of introducing some some mystery, because the reader will not know what is going on at first and will be curious. 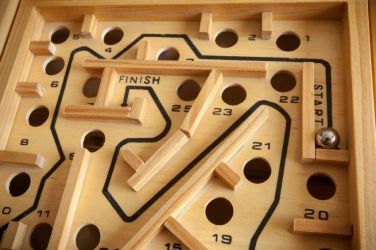 It can also create some suspense, in that you can leave an event hanging while you flash back and show what came first.